Land near the top of the photo includes a rock quarry that Shoosmith Bros. Inc. wants to use for its landfill. 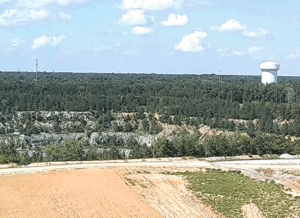 After being unanimously turned down July 25 by the Chesterfield County Board of Supervisors on its request for a permit to use a rock quarry as a landfill, the owner of the landfill, Shoosmith Bros. Inc., recently filed another lawsuit against the county in Chesterfield Circuit Court. Shoosmith’s attorney, Andrea Wortzel, filed the suit Aug. 21. 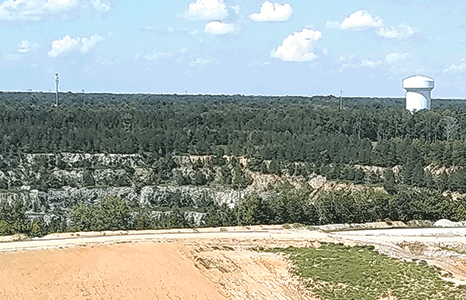 This and a lawsuit the company filed June 19, 2017, are the next steps in a battle between the county and Shoosmith over whether the company can use a rock quarry as a landfill once its current landfill is full. Earlier this year, Shoosmith’s vice president of operations, Fletcher Kelly, said the landfill has seven or eight years of life left. Once that happens, the company would like use the 83-acre rock quarry to add another 15 years of life to the 180-acre landfill. Shoosmith and the county are at odds over whether one of the conditions – No. 19 – of Shoosmith’s conditional use permit requires additional county approval. Shoosmith applied for and received that permit in 1997. Wortzel has said that her client does not plan to fill the quarry with waste as defined by Article 8 of chapter 11 of the county code. (Article 8 is titled “Approval of waste material management and disposal.”) Instead, the landfill owners believe they can use the site approval that they received from the state Department of Environmental Quality in 1999. That approval came under Article 7 of chapter 11 of the county code, which regulates siting of solid waste sites. Chesterfield Circuit Court Judge David Johnson issued a ruling on Nov. 17, 2017 that sided with the county. His ruling – which upheld a county Board of Zoning Appeals decision – dealt with only one of three issues that Shoosmith raised in the 2017 lawsuit. The company is now asking for summary judgment on parts 2 and 3, in which it argues that state law does not authorize localities to regulate landfill design, construction and operation. In addition, Wortzel argues that the county is preempted by the state’s action, specifically the Department of Environmental Quality. In a reply to Shoosmith’s recent lawsuit, deputy county attorney Jeffrey Mincks said the state Supreme Court has ruled that the state’s Solid Waste Management Act does not pre-empt localities from regulating waste management. Deputy county attorney Emily Russell filed a motion last month to dismiss parts 2 and 3 of Shoosmith’s 2017 lawsuit because they deal with the similar issues included in the 2018 suit. A hearing on that request is scheduled for Nov. 19. On July 25, the supervisors rejected the company’s permit application because they decided that they were unable to determine that the quarry posed no danger to the health, safety and welfare of people and the environment.